Our quality control process is composed of several steps that have been developed and refined over the last decade to limit or eliminate errors in the conversion process. In addition to our own in-house tools, we utilize industry-leading software to manage the process from start to finish. Our software provides batch tracking and workflow management throughout the entire conversion process. Documents are separated by specially coded sheets referred to as separator sheets. These sheets include a patch code on all 4 edges and are generally yellow in color. Additionally, the sheets are typically 8.5” x 14” in size so that they can be easily removed and reused to keep customer costs down. Because these sheets are added to a batch for the purposes of separating documents, they can be counted. This count can be subsequently used to verify that the same number of documents are processed at both the Scanning and Indexing stages of the process. Documents are fed into our high speed scanners in sets of up to 500 pages, depending on the paper quality and page weight. The scanner operator ensures that every page is captured and that the image drawn on their monitor is an accurate representation of the physical page. This process returns a total page count generated by the document capture system, and verifies the document count with those provided during the Preparation stage. Each document is displayed on the monitor of our data entry staff. A predefined schema—specific to the document type—is used to generate a form to prompt the operator for the index values. The operator captures each field from the document and saves those values to the database using a streamlined data-entry workflow. We have the capability to “double key verify” this information, which requires each document pass through another data entry station. On the second pass, a different operator repeats this step. The system responds to the second operator whenever an index value does not match what was entered by the first operator. The second operator must then review the two entries and make a decision as to the correct value. The purpose of this “double key verification” process is to minimize or eliminate data entry errors, which produces accuracy rates exceeding 99.99%. Once each step of the conversion process is complete, every batch is passed to a special team whose sole task is to find discrepancies in the process. 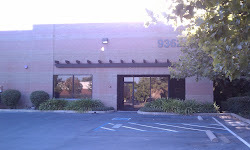 Our QC team consists of team members with years of experience in all three steps. They follow a strict procedure for verifying the accuracy of the process as a whole, as well as ensure that every document has been scanned and classified as accurately as possible. Counts from each process are compared to ensure that every document was handled at each step. Any count discrepancy triggers a full box review where every document is reviewed for accuracy and completeness. Issues at this stage of the quality control process are generally related to errors in the recognition of separator sheets and can be resolved quickly by a trained QC team member. Documents in a batch/box are randomly pulled and compared with the corresponding image files. 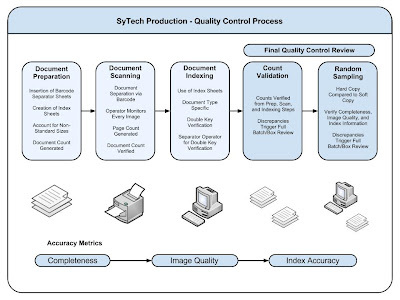 QC team members review every page of the document to make sure that the image is present, its quality is good, and that the document is complete. An additional check is made to verify that the data entry that was completed for the document is accurate and complete. Any errors caught during the random sampling triggers a full batch/box review. Completeness: every document was captured. 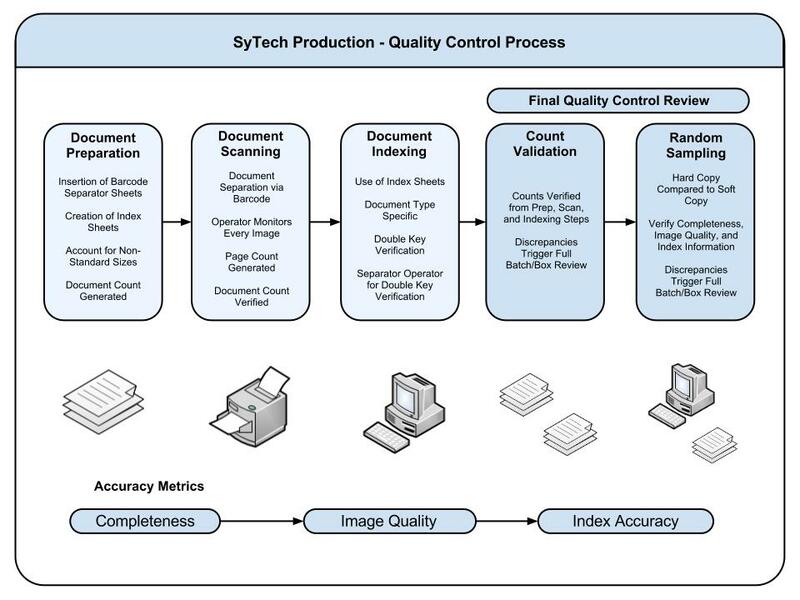 This measurement is made to determine whether all documents present in the batch/box are captured and represented as an image file in the final deliverable. Metric target level is 100% of all documents captured. 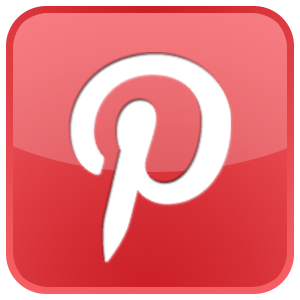 Image Quality: images are accurate representation of the original file. This is a measurement of the difference between the quality of the original document and its electronic representation. This measurement is adjusted for concessions made in consideration of cost and usability. For example, the best representation would be made using 2400 dpi full color scans that were then run through a gamut of image enhancement algorithms. The resulting images however would be unusably large and cost multiples of the acceptable rate to capture. Capture settings are therefore adjusted to presets for the types of documents being scanned. Metric target level varies depending on the document type. 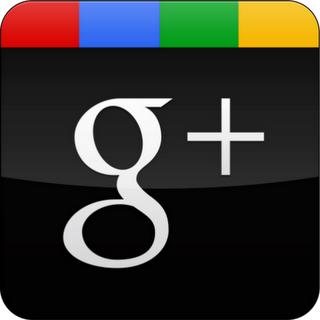 Index Accuracy: images are classified and indexed accurately for search functionality. This is a measurement of verification alert events and final QC findings. This is the most difficult metric to measure as some index information may be left to interpretation, such as handwritten data. We recommend capturing a minimum of 3 fields per document to ensure that each document can be found even in cases where index values are subjectively interpreted. Fields that are “double-key verified” achieve 99.99% accuracy. Oh Great! It gives very useful process that is the document and conversion process and three types of Accuracy Metrics Measured During Conversion.